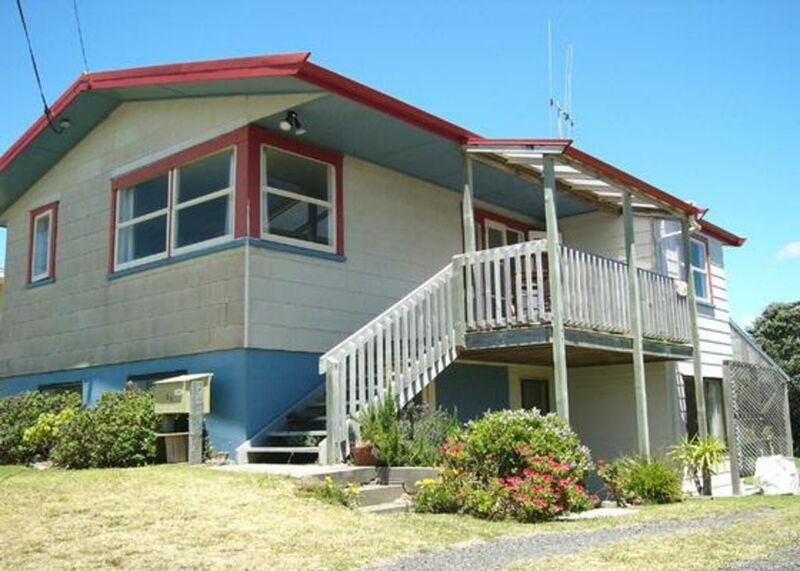 This two storey family bach is in a great Waihi Beach location, across the road from the beach, stream, park and swings. Few minutes walk to the village shops, cafes and restaurants. Can see the surf if its worth riding. Large flat section at the back fantastic for cricket, touch and BBQ's. Lots of choice outdoor kiwi activities available, fishing, surfing, diving, kayaking, water skiing, great walks (Karangahake Gorge, Orakawa Bay), and for the kids Putt-Putt round the corner. High chair for babies. First floor - Bedrooms 1 and 2 , lounge, dining room, kitchen and bathroom. Has a covered deck. Ground floor - Laundry, bathroom and bedroom 3, large rumpus room with 2 single beds. Covered carport attached to house great for outdoor dining and BBQs, while watching the kids play on the back lawn. There is external stair access only between the floors. 2 nights minimum. Long weekends subject to peak rates. Pets can sleep in the laundry, but are not allowed inside the house. Rubbish collection at the gate is every Monday 7:30am. Prepaid council green bags can be purchased from the 4-Square supermarket at Wilson Rd shops. Otherwise take your rubbish with you when you depart. I live in the Bay and grew up not far from our bach and spent a lot of time as I was growing up staying at the bach playing on the beach and in the water, fishing, boating and diving. This is my favorite place to be. My Grandfather built this house and it has been in the family for generations. We have upgraded it over the years but it still has the original character and is a place all our family love staying at and having fun at the beach. Large flat section with pohutukawas at the back. Just across the road from the beach. The stay was pleasant with good instructions. My requests for information were answered fully and quickly. The place looked great once the lawns were mowed. Casual easy Bach. Well provisioned. Good sleeping spaces. Wifi would help improve. Not fenced for pets but appreciated being able to have the dog there. Very helpful host. Great location. A proper Bach. Had everything you need. Good to have two separate areas for sleeping up stairs and down, two shower areas. Didn't have to use it put plenty of lawn area out the back. Great location easy access to beach. Can check out the conditions from the deck. Would stay again. Seaforth road is busy. We really enjoyed ourselves at Matt’s. The location was perfect - across the road from the beach (accessed via the reserve) and 2 minutes from the main Waihi Beach shops. It perfectly accommodated our two families (one up and one down) with plenty of space. The kids also loved the tramp, rope swing and large backyard. As per the description, there is no access downstairs internally which was not a biggie for us but could be for those with younger kids. Apart from that, if you want a great bach for the family that won’t require you being precious, this is the place for you!